ABBOTSFORD – The BC Agriculture Council is adding aquaculture to its roster. “We farm animals and this is the group that farms animals,” BC Salmon Farmers Association executive director Jerry Dunn told BCAC members at their annual meeting in Abbotsford on April 12, in explaining why BCSFA members want to join. BCAC chair Stan Vander Waal called land-based salmon farmers a welcome addition. Terry Brooks of Agassiz, a 30-year salmon farmer, will represent them on the BCAC board. 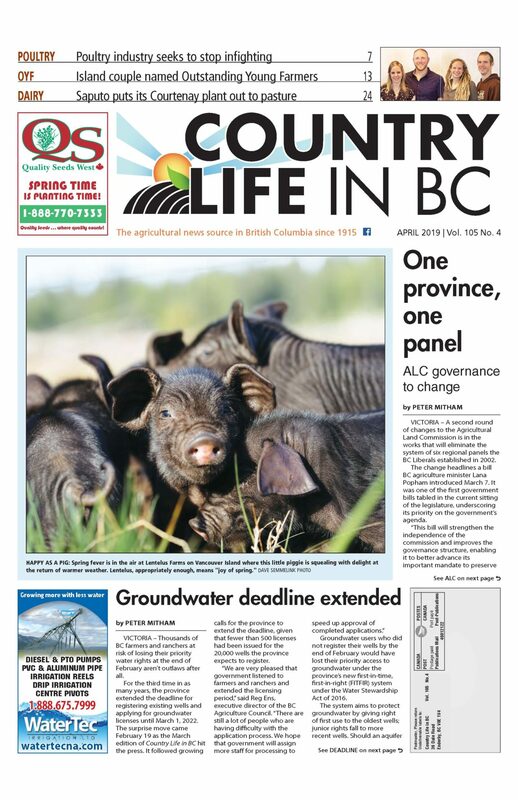 BCAC gave salmon farmers their own council seat but is not expanding the board as the BC Pork Producers Association have merged their position with the BC Cattlemen’s Association. Although the BCSFA has only 50 members, their farmgate receipts make aquaculture the third largest group in BCAC, behind only dairy and poultry. BCAC also approved adding the BC Mushroom Growers Association. Mushroom growers will not receive their own seat, instead joining one of the four horticulture groups already represented at the board. Although BCAC added aquaculture and mushrooms to their mix, they lost community agriculture with the dissolution of FARM – the Food and Agriculture Responsibility Members Community Council – in February. Megan D’Arcy of the Smithers Farmers Institute, FARM’s representative who shared a director’s position with Certified Organic Associations of BC executive director Jen Gamble, hopes the absence is temporary. Brooks’ addition is not the only change to the 2017 BCAC board. With pork producers giving up their seat, Rolf Soth has departed as a director. As well, Sukhpaul Bal of Kelowna is replacing Steele as the interior horticulture director while Barry Follensbee of Dawson Creek is replacing Garnet Berge as the grain, oilseeds and forage director. The BC Poultry Association has yet to name a replacement for Raymond Bredenhof who has also stepped down. Effective representation for and from all sectors of agriculture is just one of BCAC’s priorities for 2017. Vander Waal identified collaboration, delivery of programs and services, increasing operational capacity and building public trust as other priorities for the year ahead. Although BCAC did not host an ag day, it is a priority for this fall so the industry can connect with the new provincial government. Executive director Reg Ens also announced the council has posted a notice for a new director of communication and engagement. One of the hire’s new responsibilities will be to lead the council’s public trust initiative. Council members approved a special levy totaling $100,000 to fund the proposed program. Building public trust is critical, says Farm Credit Canada director of industry and stakeholder relations Mark Seymour. FCC hired the cattleman and former chief executive officer of the Canadian Western Agribition “to fill a gap” and he has spent the past year traversing the country encouraging producer groups to get on board with the public trust bandwagon. “Public trust is the only thing that’s bringing Canadian agriculture together,” he says. While producers consider water the most important ingredient in modern agriculture, Seymour says “trust” is the most important ingredient for consumers. He said consumers are “way ahead of us” in accessing information, noting half of the planet can now access the Internet everyday. He says “trust” has more currency that science, pointing out Tim Horton’s ranks among the top 10 most influential companies (Google is number one) and tops the list of “trusted” companies. Science may not support the perceived benefits of raised without antibiotics (RWA) or cage-free production but consumers and shareholders do. A&W’s share price has gone up 50% since introducing its RWA program. McDonald’s share price has also shot up since committing to all-day breakfasts using cage-free eggs. Seymour admits Millennials, who will outnumber Baby Boomers by 2030, can be quite contradictory. Seymour challenged his audience to be part of the solution. His instructions: “Learn more about agriculture.